The “Alaturi De Presedintele Meu” facebook page also posted this pic and got a couple thousand likes! You should be proud, Sam. Sorry Sitara, but it is normal that the people whose pensions and salaries were reduced to vote against Basescu. Unfortunately nobody (including PSD/USL, whatever) was able to find solutions to the country deficit. 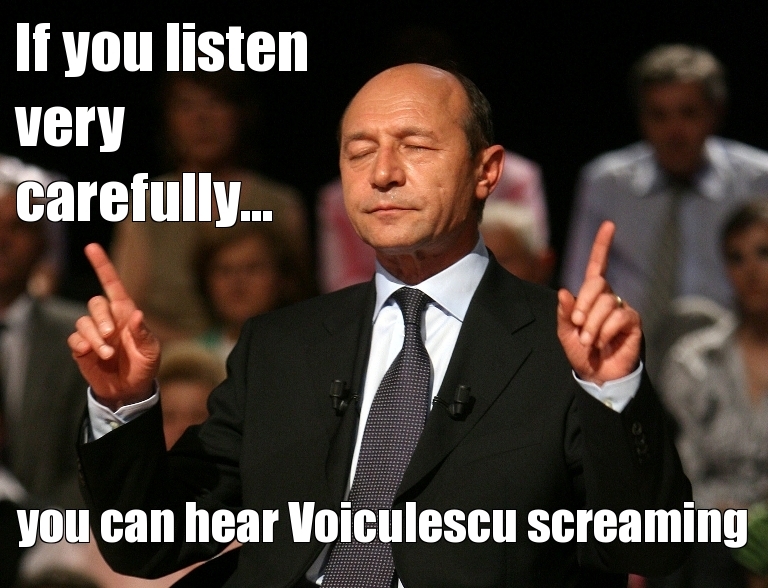 Basescu is paying for taking the rough but necessary measures. But Sam is right, the hate of Voiculescu and the rest of robbers is immense since Basescu started to unveil their dirty games and send them to justice. Maybe basescu should be careful, one day all that hate may turn against him, unveil his dirty games and send him to justice, too. His time will come but let’s take the criminals chronologically shall we? You may be surprised but I was never and I’m still not against cutting off wages (pensions weren’t actually reduced per se but many old people had to pay for more than a year the health contribution computed in a downright outrageous manner before it was ruled out as neconstitutional). What I ask is for these sacrifices to count for something (wages and pensions reduced and yet IMF owns our arse) and, if you’re sitting and doing nothing more than to cut and cut again, someday you’ll find out that you can cut off now your own fingers, as there is nothing more to be cut off. Do start to implement also some real measures to ensure at least a bit of economic growth, not that imbecility called minimum tax which made even Pakistan to laugh at us. Secondly, if you want my taxes and my support, do start to respect me a little. It doesn’t even cost a penny. Do begin to act and speak like a President and not like a street gangleader. But if you act like a buccaneer, don’t be surprised to see 7,4 million of mutineers in your crew. Remember that you’re the one who should serve this people and not the other way around. Remember that those you’re looking down your nose are among the ones who pay your wage. Do stop lying to me (and Angela Merkel and who knows how many others…) in my face without even batting an eyelash. You’re now according to your own definition a liar (2007) and a coward (2012) so how would you convince me to want you as my President? And if we talk about robbers…oh boy. For instance, you got Adrian Nastase sentenced to two years in prison for something he did (or did not) as PSD’s leader and candidate for presidency, not as PM as those cretins from Bruxelles crowed. Finally, the great corruption was decapitated and the responsibles for ruining this country were put behind bars. If this had been more than a show, 8 years would have been more than enough to investigate the man held responsible for ruining Romania’s industry, gather solid evidence, instrument a fair trial and condemn him to a lifetime in prison, without parole, if the judges had deemed so. Then you could have said that the great corruption has received a mortal wound during your mandate. I can actually hear 7.4 million people screaming. Are they all called Voiculescu? “sticking out her tongue” C’mon, Sam, you can do better than this, can’t you? I can actually also hear the 111,842 Romanians who participated in the referendum only to cancel their votes. Yes, I can hear myself screaming too. I went on July 29 and barred the “No” because I have waited for a long time to get rid of basescu. However, I also barred the “Yes” because I couldn’t agree with USL’s bending the law, all their abuse and mishmash. So in the end I placed the stamp on a message I wrote in support for the monarchy. I hereby volunteer myself for the position of king!